Agent Mulder plugin for ReSharper provides navigation to and finding usages of types registered or resolved via Dependency Injection (DI) containers. June 06th, 2015 v1.2.0 released! Agent Mulder plugin for ReSharper analyzes DI containers (Dependency Injection, sometimes called Inversion of Control, or IoC containers) in your solution, and provides navigation to and finding usages of types registered or resolved by those containers. With all the major benefits of using smart DI containers to wire up dependencies in code, it breaks automatic code-analysis tools like ReSharper, because DI containers will only create concrete types at run-time (typically using Reflection), and this information is not known during static code analysis. Agent Mulder aims to solve that problem! 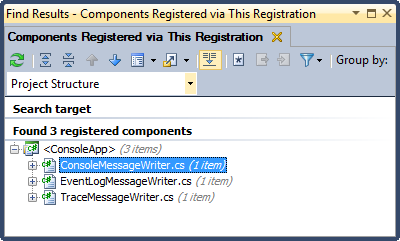 To build the plugin you need to have the ReSharper SDK (v6.1.x at the time of writing), installed on your machine. The project will add the references automatically. To build the plugin, run the file src\build.cmd. The files will be built and placed into the directories output\Debug and output\Release. 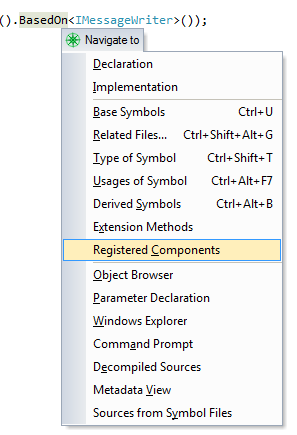 In the directory will also be a batch file that copies the files into the ReSharper's plugin directory. You will need to restart Visual Studio to see the changes. Q: Wow! How does it work? A: Agent Mulder makes heavy use ReSharper's Structural Search to look for registration patterns, such as Component.For<$service$>(). This makes searching very efficient and does not require any additional parsing. This also allows for adding new patterns easily, allowing adding support for additional DI containers. More information is available in the wiki page. Q: What DI containers are currently supported? A: The list of the currently supported DI containers and their syntax can be found on the wiki page. Q: What about X (Ninject/StructureMap/Unity)? Can you add support for it? A: Great question! Suggest a feature on the issue tracker, or better yet, send me a pull request! Q: Why the name Agent Mulder? Q: I found a bug/Agent Mulder highlights the wrong type (or doesn't)/It doesn't work! A: Great! Let me know about it, and I will try to fix it! Please note that I don't know all DI containers and their rules - if you think a mistake in analysis has been made, please note what should be the desired outcome in the issue. Q: What font did you use for the logo? A: It is called simply "The X-Files" by SpideRaY, and is available to download here. Also please note that Agent Mulder plugin requires ReSharper 6.1 or ReSharper 7 and works in both Visual Studio 2010 and Visual Studio 2012. Other versions were not tested!